Seasons in the Sun was inspired by the song of the same name, which had been popular some years before. This piece was worked when novelty threads were just new on the market. Before this we worked most designs in Persian wool. I was especially enamored of the new metallic threads by Kreinik, and I used them as the base of this design. Kreinik only had 10 colors at the time. 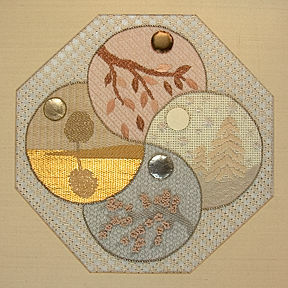 I used gold for summer, copper for autumn, metallic white for winter, and silver for spring. there has been some criticism of my use of silver and grey for spring, but if you lived where I do, you wouldn’t even wonder at this color choice. Other threads used were Medici wool, Soie d’Alger (French) silk, Marlitt, Japanese gold, and Ultra Suede. I also appliqued the “suns” from four different colors of metallic kidskin, and surrounded each “sun” with metal purls and beads. Before doing “Seasons in the Sun” I had been exploring other threads and liked the finer effects possible. But my earlier multi-thread compositions had all been samplers; this was my first true design in multi threads.